There are so many benefits of making your own baby food at home, like saving money and knowing exactly what your baby is eating, not to mention it lasting up to a month in the freezer. But have you ever made baby food, like a banana purée, and froze it, only to have it turn brown when it thaws out? 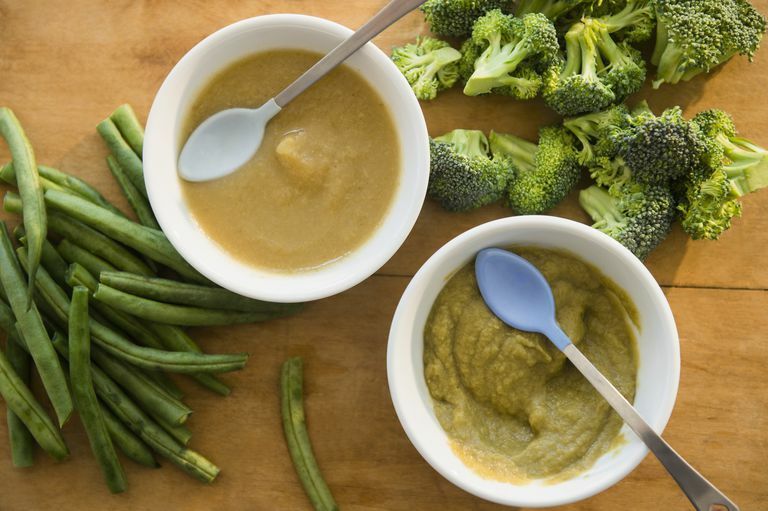 Homemade baby food turning brown is a common problem that occurs in fruits and vegetables, but the important thing to know is that browning isn't indicative of a bad batch of baby food. It just means that you haven't added the artificial preservatives of commercial baby foods (and that's a good thing) that prevent oxidization. It comes down to science. Browning occurs when fruits and vegetables are exposed to oxygen or air, known as oxidization, and the puréed aspect of baby food speeds up the discoloration. Provided that you've chosen fresh, quality produce that hasn't spoiled, browning is almost always an aesthetic problem, not a nutritional one. As unappetizing as the food may look, it's still completely safe to eat, but there are a few things you can do to keep your baby food looking fresher longer. Add juice: Sprinkle one or two drops of citrus juice — lemon, lime, orange or pineapple — into the purée to keep it fresh. The juice is essentially citric acid, which prevents oxidization. Add yogurt: Mixing fruit purées with a bit of natural yogurt reduces browning and adds a boost of calcium. Freeze it: Immediately after preparing the baby food put it in an airtight container in the freezer. Then, let it thaw out and it's ready to serve. Invest in a vacuum sealer: Vacuum seal the baby food to keep air out and prevent browning. Don't make baby food in advance: Foods like bananas and avocados don't freeze well, so they aren't the best to prepare beforehand. Instead, prepare them on the spot. All you have to do is mash and serve, so you'll never have to worry about browning. Adding a splash of citrus juice to your baby food purée is the most widely recommended solution to keeping food fresh, but citrus fruits are not recommended for infants until they are at least 10 to 12 months old, and some babies react negatively to citric acid, so you may want to check with your doctor first. However, there is a big difference between giving your baby a big, juicy wedge of grapefruit or bottle of orange juice and adding a drop or two of lemon juice to a batch of homemade baby food. If you are concerned about your baby's citric acid intake, talk to your pediatrician or simply allow the food to turn brown. After all, it's completely natural.